Create a WOW card that is extra special with this dynamic and FREE (through March 31st ONLY) Sale-A-Bration Sheer Perfection Designer Vellum Stack. (Free is always extra special, isn't it??) What a blast we had at the recent Spring Sparkle Crafternoon card making class. 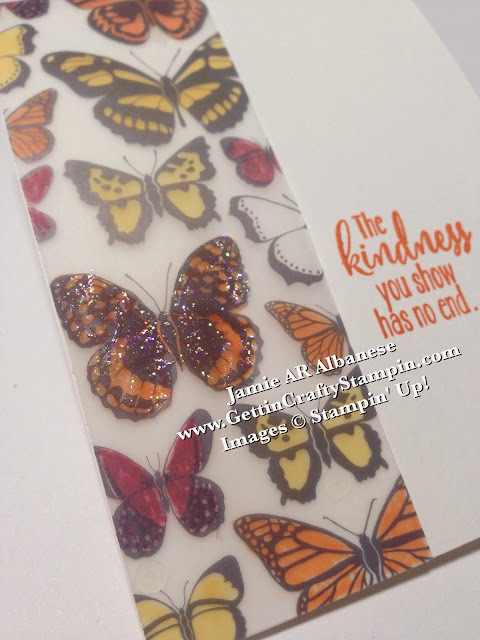 See how easy and fun it is to create this delightful hand-crafted card that reminds me of stained glass. This simple technique will WOW. 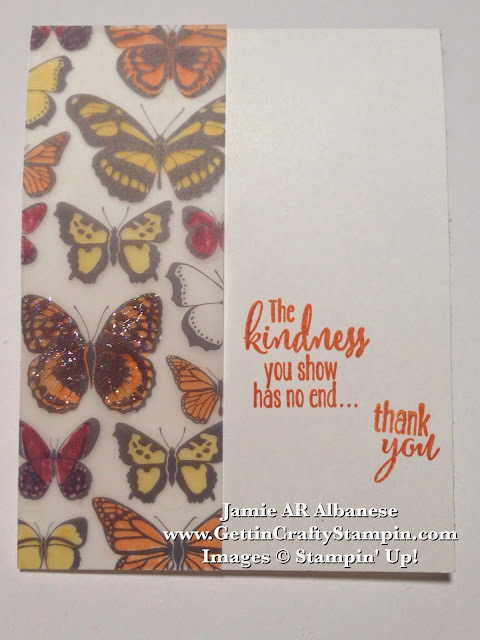 Simply color the back (matte) side of this printed Sheer Perfection Vellum with our Brights Stampin' Write Markers. 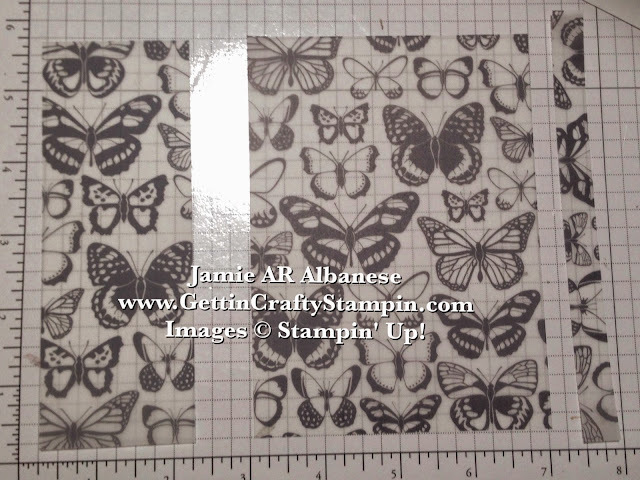 Using our Glue Dots (103683) to adhere it to the Whisper White card stock. 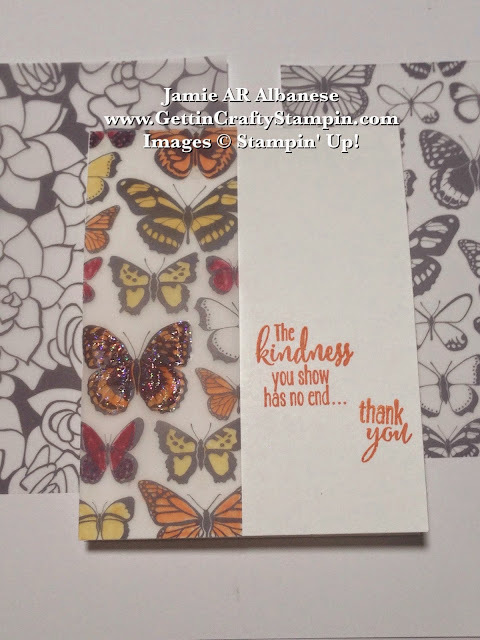 Paint the Lotus Blossom FREE Sale-A-Bration stamp sentiment with the Pumpkin Pie Stampin' Write Marker and stamp near the butterfly you want to highlight. Using the fine tip on the Dazzling Details, paint the butterfly your highlighting. This takes a little bit to dry and will create a slight rippled effect as it dries but I really like that look. Send some cheer and a little bit of Spring with this easy and dynamic hand-stamped card. 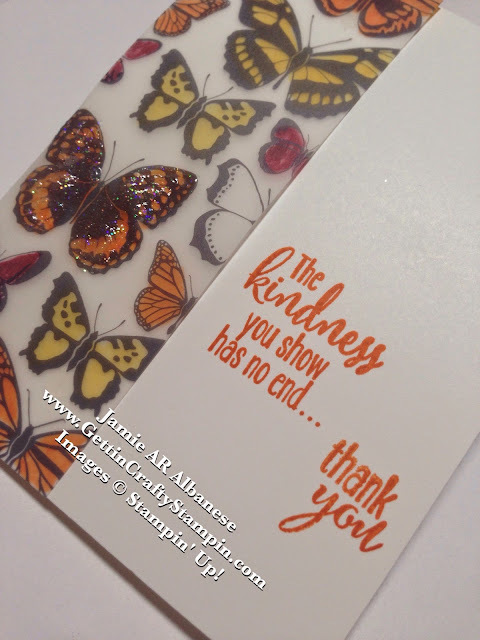 This WOW hand-crafted card is extra special with the FREE Sheer Perfection Designer Vellum Stack (Free for the Next Week - then it's gone!!). This is a fun and easy hand-stamped card that is extra sweet thanks to the FREE Lotus Blossom stamp set and Sheer Perfection Vellum Stack. I love when it's easy to WOW and send a beautiful hand-crafted card. This one is Spring and beauty all rolled into one hand-made card! Snag YOUR Free Goodies while you can (through March 31st) and have fun creating beautiful works of art that deliver smiles in the mail!